The first recorded capture of a trout on a fly in Tasmania was reported in the ‘Illustrated Australian News’ in 1876 when Matthew Seal, in the company of Morton Allport, landed a fish near New Norfolk. The Great Lakes region in central Tasmania is largely responsible for Tasmania’s reputation as an anglers paradise. The area includes such iconic fishing locations as Little Pine Lagoon, Penstock Lagoon and Bronte Lagoon. It also includes an area known as the Western Lakes, comprising more than 3000 lakes, ponds and tarns, stocked with brown trout, and in some lakes rainbow trout. From the 1930s to the 1960s Great Lake became synonymous with the famous Shannon Rise. The ‘Rise’ referred to the mass hatching of millions of snowflake caddis moth on a fast flowing half-mile stretch of water running between Great Lake and Shannon Lagoon. Usually beginning in December each year, large numbers of trout would congregate to feed on the hatching moths. The Shannon Rise was a major annual event attracting fly fishers from around the world until its demise with the re-routing of the river in 1963. In the 1970s the flooding of Lake Pedder in Tasmania’s south west briefly established the area as a trout fishing hotspot to rival the spectacle of the Shannon Rise. Excellent catches of large trout were made because of the abundant food supply available for fish on the banks of the filling lake. Notwithstanding these brief but unique phenomena, Tasmania’s proliferation of picturesque rivers and small streams, such as Brumbys Creek, provide excellent opportunities for fly fishing. David Scholes described several of his favourite spots —the Break O’ Day River ‘in short, it is a magnificent little river’, and the St. Patricks River ‘usually as clear as gin’. The establishment of several private commercial fly fishing ventures have also enhanced Tasmania’s reputation as a world class fly fishing destination. 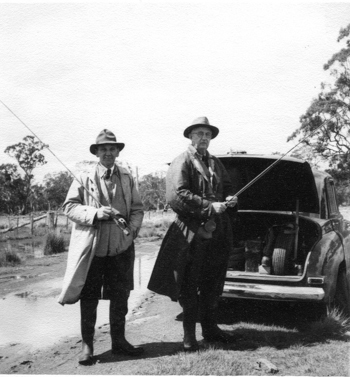 In 1988 the World Fly Fishing Championship was held in Tasmania, focussing international attention on this unique resource.